Soo after doing my October Lust post last night I decided that I neeeeeeded to go and treat myself to lots of beautiful new products. Not because I can even afford to, but you only live once and they say that shopping is cheaper than a therapist/psychiatrist and it did really make me happy, ahh the simple pleasures in life. 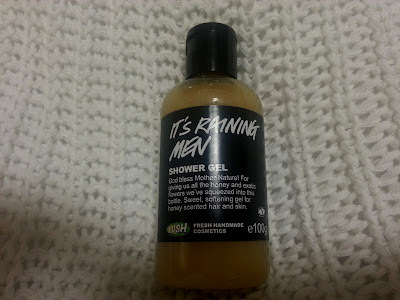 Basically, I am just going to talk you through what I got, I got a lot more than what is on this post, but so much that i've had to split it into sections, so a warm welcome to the Lush section of my haul! I will be reviewing each product probably next week one by one, simply because I need the chance to actually use them so that I can give you all an accurate review. So yeah, I found myself in Lush - I haven't been in Lush for at least a year, mainly because I still get my fave products for Christmas/Birhday every year but also because i'm sure there's wiser things to spend my money on, but I just fancied a pampering session AND I wanted to show you guys their latest products so this one's for you. The lady who served me was called Jo, she literally gave me outstanding customer service and helped me out with everything - she even let me sample the products that I didn't buy. V.impressed and I want the whole shop for Christmas...please Santa. Yayyy, something ticked off my October Lust List! The cupcake face mask! Aaaah I used to use this when I was younger but just because I wanted to smear chocolate on my face and loved the fact that it was called 'cupcake' how creative but what a great selling point 'Mum, i'm just going to put some cupcake on my face' haha, once again, the simple pleasures... but now I am a 'reviewer' as such, I am going to be looking at this product in a much more 'professional' manner if you like. I will use it tonight after my shower and will report back as soon as possible, somehow, I doubt it will beat my beloved GlamGlow, literally the best facepack that has ever graced the Earth. But i'll give it a chance. 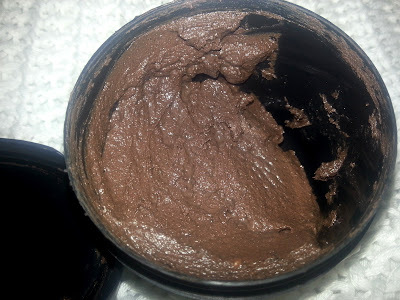 What you need to know about this product though, is that it smells delicious, it has chocolate in it (omg - whats not to love) AND it's meant to stop your skin from getting oily, thus = GOODBYE SPOTS. And she ticks another thing off her list... I have wanted this ever since reading about it in the Joliebox magazine. 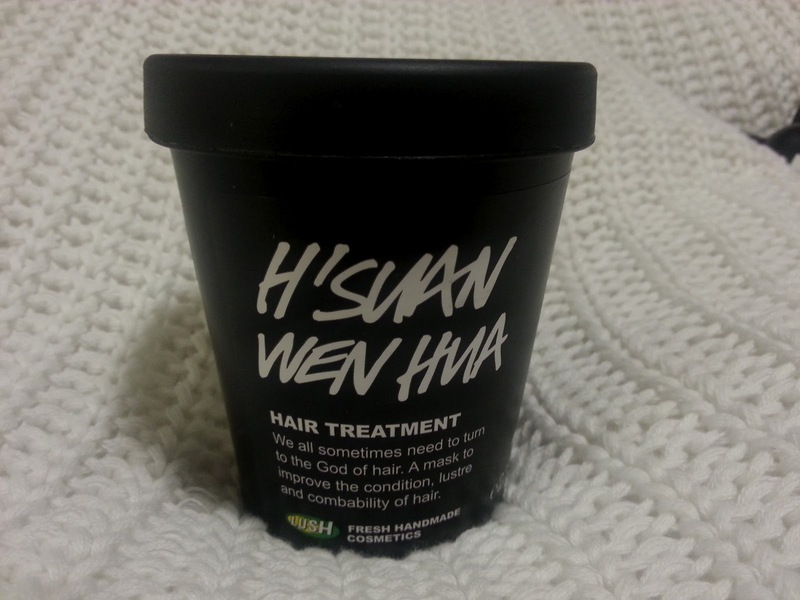 It was basically recommended for bad skin days and to hydrate the skin on long flights or warm days etc. Basically doubles up. I currently use a Dermalogica toner and whilst it's good, there isn't anything natural or spot fighting in it, it literally is just for hydration... 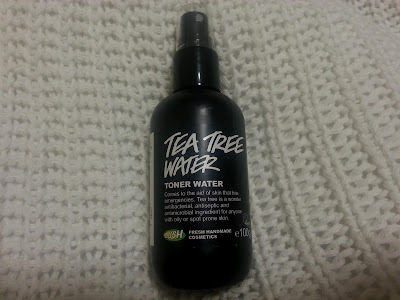 I want to try this because it has tea tree in it, everyone knows that's for spot fighting... I spoke to the lady and she said just be careful with this, only put it on oily areas or it will dry up your whole face, so I am going to take this advice and use this for the first time tonight. Once again, a full review of this product will be up as soon as i've tested it for a while, then it's an accurate review. This was only £3.95 so it'd be rude not to. So this is a bit of a wildcard product and I just smelt it and thought I NEED YOU IN MY LIFE. I lovee the smell of Lush's soap 'Honey I washed the kids' because it is so, uerm... honeyey... No it's literally the sweetest smelling soap ever, not sickly, just perfectly sweet. Butttt, unfortunately, like anyone soap dries my skin out so I was soo excited to see 'It's Raining Men' which can be used as a shower gel AND shampoo and smells exactly the same as 'Honey I washed the kids', hooray for glorious smelling locks and a gorgeous smelling body. I just had to get it. 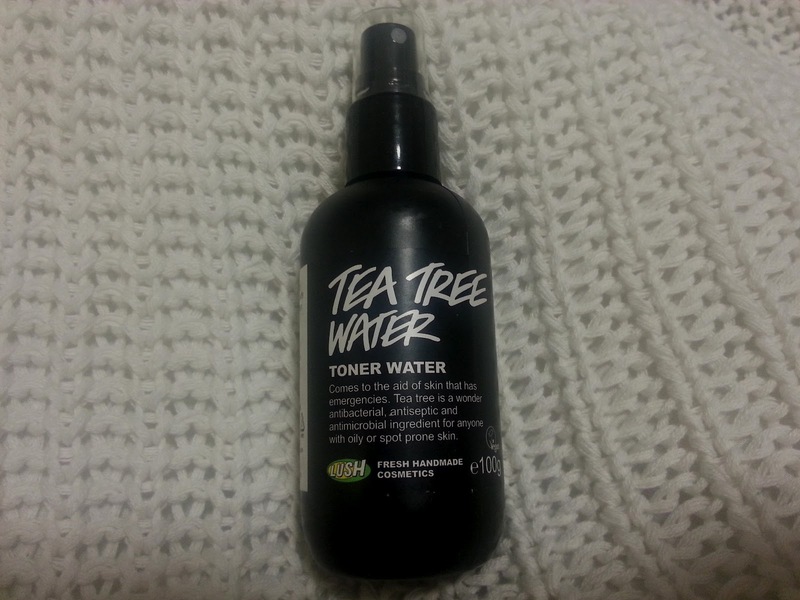 It was quite expensive though, more than the toner which shocks me, it cost £4.25 for this teeny bottle so it better be worth it, it smells great anyway, I just hope that smell lasts. Whilst buying the whole shop, I stopped to ask if they still did the shower bath bombs, but unfortunately the answer was no (why!) they were so great for those of us who can't always be bothered to have baths. So instead, the lovely sales assistant showed me this, the 'Stepping Stones Foot Scrub', I NEVER exfoliate my feet, even though I probably should but hey, why would I? Should I? Do you exfoliate your feet?! What this does is interesting though, she said to put a bit of it in my shower and that the smell will fill up my shower and then the exfoliating crystals will be left at the bottom of the shower in a foam and will exfoliate the bottom of my skin. This was only £2.95 and it can just be used in tiny chunks so I think this will be a bargain product. Whilst we were going round the store (it felt like a personal shopping experience) Jo gave me lots of samples to help me out with my reviews. 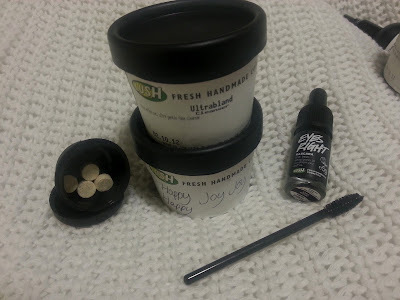 She gave me a sample of another hair treatment, 'HappyHappyJoyJoy', some teeth whitening tablets (interesting), definitely something that I am sooo excited to review, they're one of a kind, tablets that you nibble and then they turn into a foamy toothpaste... VERY interesting..Oooh AND some mascara... aaahhh mascara that is good for the eyes? I have never heard of such a thing. 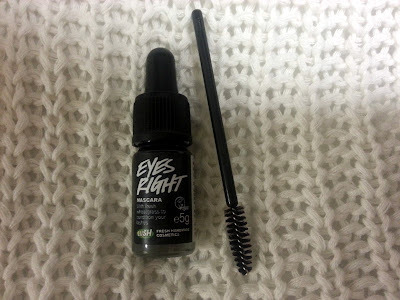 I'm probably a bit negligent when it comes to beauty products though, I hate to admit it, but I never really go for things that are 'good for my skin' just because I'm lazy... but that's probably why I get break outs, so I can't wait to give this mascara a go and see what it's really like in comparison to the over perfumed high street mascaras. So, I was very impressed with Lush. My faith and love for the store has been restored and it was like I never stopped shopping there. I now have a list as long as my arm of products that I NEED to try from there... what's great though is that they're all good for you so you don't have to feel guilty when using any of their products. Maybe it's worth paying a tiny bit extra because of all the goodness in their products? Do you shop at Lush? 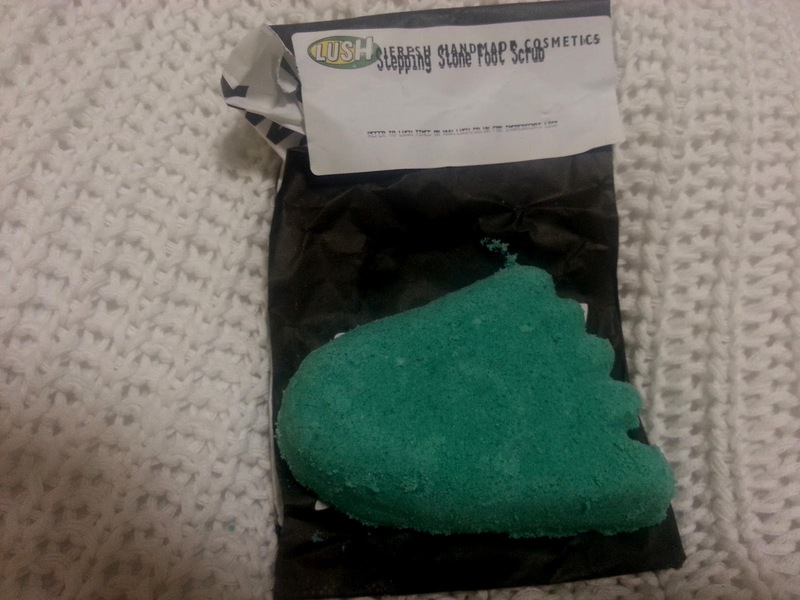 What are your favourite Lush products and why? great blog thanks for sharing that with us. 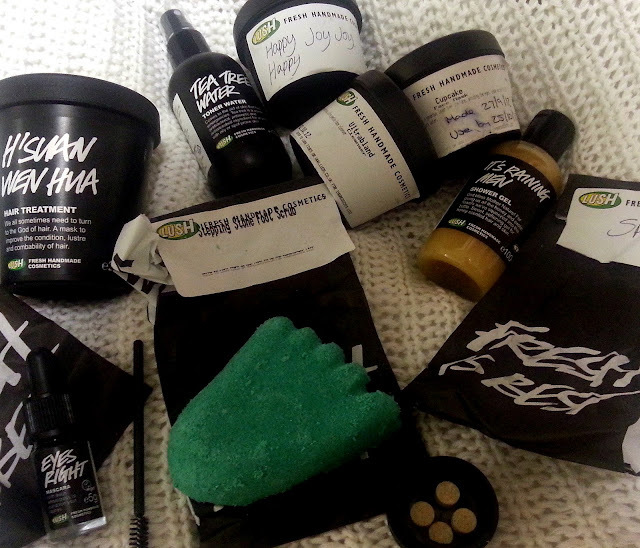 I need everything on this haul post,Lush is like heaven for me,Well Jell! I am heading in to Lush today and now feel I want a haul too! I may buy the tea tree water and the cupcake mask! You should defo try the lip scrub - they do a lovely chocolatey one I think you'd love and the Honey Trap lip balm tin is another fave which I think you'd love! I love this review. I only wish i could afford these products smh. One day!! Thanks for following my blog. And Keep up the great work on yours. have a great day!!! Now I must try some of those products.